Concrete is an extraordinarily versatile building material used for utilitarian, ornamental, and monumental structures since ancient times. Composed of a mixture of sand, gravel, crushed stone, or other coarse material, bound together with lime or cement, concrete undergoes a chemical reaction and hardens when water is added. Inserting reinforcement adds tensile strength to structural concrete elements. The use of reinforcement contributes significantly to the range and size of building and structure types that can be constructed with concrete. While early twentieth century proponents of modern concrete often considered it to be permanent, it is, like all materials, subject to deterioration. This Brief provides an overview of the history of concrete and its popularization in the United States, surveys the principal causes and modes of concrete deterioration, and outlines approaches to repair and protection that are appropriate to historic concrete. In the context of this Brief, historic concrete is considered to be concrete used in construction of structures of historical, architectural, or engineering interest, whether those structures are old or relatively new. The ancient Romans found that a mixture of lime putty and pozzolana, a fine volcanic ash, would harden under water. The resulting hydraulic cement became a major feature of Roman building practice, and was used in many buildings and engineering projects such as bridges and aqueducts. Concrete technology was kept alive during the Middle Ages in Spain and Africa. The Spanish introduced a form of concrete to the New World in the first decades of the sixteenth century, referred to as “tapia” or “tabby.” This material, a mixture of lime, sand, and shell or stone aggregate mixed with water, was placed between wooden forms, tamped, and allowed to dry in successive layers. Tabby was later used by the English settlers in the coastal southeastern United States. Figure 1. 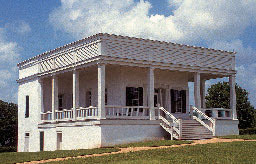 The Sebastopol House in Seguin, Texas, is an 1856 Greek Revival-style house constructed of lime concrete. Lime concrete or "limecrete" was a popular construction material, as it could be made inexpensively from local materials. By 1900, the town had approximately ninety limecrete structures, twenty of which remain. Photo: Texas Parks and Wildlife Department. The early history of concrete was fragmented, with developments in materials and construction techniques occurring on different continents and in various countries. In the United States, concrete was slow in achieving widespread acceptance in building construction and did not begin to gain popularity until the late nineteenth century. It was more readily accepted for use in transportation and infrastructure systems. The Erie Canal in New York is an example of the early use of concrete in transportation in the United States. The natural hydraulic cement used in the canal construction was processed from a deposit of limestone found in 1818 near Chittenango, southeast of Syracuse. The use of concrete in residential construction was publicized in the second edition of Orson S. Fowler’s A Home for All (1853) which described the advantages of “gravel wall” construction to a wide audience. The town of Seguin, Texas, thirty-five miles east of San Antonio, already had a number of concrete buildings by the 1850s and came to be called “The Mother of Concrete Cities,” with approximately ninety concrete buildings made from local “lime water” and gravel (Figure 1). Figure 2. Chatterton House was the home of the post trader at Fort Fred Steel in Wyoming, one of several forts established in the 1860s to protect the Union Pacific Railroad. The walls of the post trader's house were built using stone aggregate and lime, without cement. The use of this material presents special preservation challenges. Impressed by the economic advantages of poured gravel wall or “lime-grout” construction, the Quartermaster General’s Office of the War Department embarked on a campaign to improve the quality of building for frontier military posts. 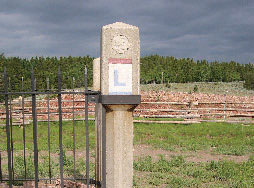 As a result, lime-grout structures were constructed at several western posts soon after the Civil War, including Fort Fred Steele and Fort Laramie, both in Wyoming (Figure 2). By the 1880s, sufficient experience had been gained with unreinforced concrete to permit construction of much larger buildings. A notable example from this period is the Ponce de Leon Hotel in St. Augustine, Florida. Figure 3. The Lincoln Highway Association promoted construction of a high quality continuous hard surface roadway across the country. The Boys Scouts of America installed concrete road markers along the Lincoln Highway in 1928. Extensive construction in concrete also occurred through the system of coastal fortifications commissioned by the federal government in the 1890s for the Atlantic, Pacific, and Gulf coasts. Unlike most concrete construction to that time, the special requirements of coastal fortifications called for concrete walls as much as 20 feet thick, often at sites that were difficult to access. Major structures in the coastal defenses of the 1890s were built of mass concrete with no internal reinforcing, a practice that was replaced by the use of reinforcing bars in fortifications constructed after about 1905. The use of reinforced concrete in the United States dates from 1860, when S.T. Fowler obtained a patent for a reinforced concrete wall. In the early 1870s, William E. Ward built his own house in Port Chester, New York, using concrete reinforced with iron rods for all structural elements. Despite these developments, such construction remained a novelty until after 1880, when innovations introduced by Ernest L. Ransome made the use of reinforced concrete more practicable. Ransome made many contributions to the development of concrete construction technology, including the use of twisted reinforcing bars to improve bond between the concrete and the steel, which he patented in 1884. Two years later, Ransome introduced the rotary kiln to United States cement production. The new kiln had greater capacity and burned more thoroughly and uniformly, allowing development of a less expensive, more uniform, and more reliable manufactured cement. Improvements in concrete production initiated by Ransom led to a much greater acceptance of concrete after 1900. The Lincoln Highway Association, incorporated in 1913, promoted the use of concrete in construction of a coast-to-coast roadway system. The goal of the Lincoln Highway Association and highway advocate Henry B. Joy was to educate the country in the need for good roads made of concrete, with an improved Lincoln Highway as an example. Concrete “seedling miles” were constructed in remote areas to emphasize the superiority of concrete over unimproved dirt. The Association believed that as people learned about concrete, they would press the government to construct good roads throughout their states. Americans’ enthusiasm for good roads led to the involvement of the federal government in road-building and the creation of numbered U.S. routes in the 1920s (Figure 3). Figure 5. 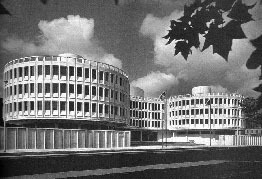 Following World War II, architects and engineers took advantage of improvements in concrete production, quality control, and advances in precast concrete to design structures such as the Police Headquarters building in Philadelphia, Pennsylvania, constructed in 1961. Photo: Courtesy of the Philadelphia Police Department. Figure 4. The highly ornamental concrete panels on the exterior facade of the Baha'i House of Worship in Wilmette, Illinois, illustrate the work of fabricator John J. Earley, known as "the man who made concrete beautiful." During the early twentieth century, Ernest Ransome in Beverly, Massachusetts, Albert Kahn in Detroit, and Richard E. Schmidt in Chicago, promoted concrete for use in “Factory Style” utilitarian buildings with an exposed concrete frame infilled with expanses of glass. Thomas Edison’s cast-in-place reinforced concrete homes in Union Township, New Jersey (1908), proclaimed a similarly functional emphasis in residential construction. From the 1920s onward, concrete began to be used with spectacular design results: examples include John J. Earley’s Meridian Hill Park in Washington, D.C.; Louis Bourgeois’ exuberant, graceful Baha’i Temple in Wilmette, Illinois (1920–1953), for which Earley fabricated the concrete (Figure 4); and Frank Lloyd Wright’s Fallingwater near Bear Run, Pennsylvania (1934). Continuing improvements in quality control and development of innovative fabrication processes, such as the Shockbeton method for precast concrete, provided increasing opportunities for architects and engineers. 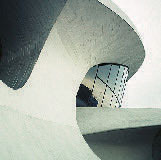 Wright’s Guggenheim Museum in New York City (1959); Geddes Brecher Qualls & Cunningham’s Police Headquarters building in Philadelphia, Pennsylvania (1961); and Eero Saarinen’s soaring terminal building at Dulles International Airport outside Washington, D.C., and the TWA terminal at Kennedy Airport in New York (1962), exemplify the masterful use of concrete achieved in the modern era (Figure 5). Figure 7. Detailed bas reliefs as well as sculptures, such as this lion at the Bailey Magnet School, could be used as ornamentation on concrete buildings. Sculptural concrete elements were typically cast in molds. Throughout the twentieth century, a wide range of architectural and engineering structures were built using concrete as a practical and cost-effective choice—and concrete also became valued for its aesthetic qualities. 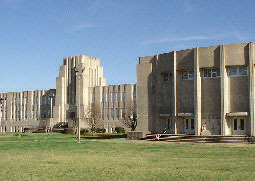 Cast in place and precast concrete were readily adapted to the Streamlined Moderne style, as exemplified by the Bailey Magnet School in Jackson, Mississippi, designed as the Jackson Junior High School by N.W. Overstreet & Town in 1936 (Figs. 6 and 7). The school is one of many concrete buildings designed and constructed under the auspices of the Public Works Administration. 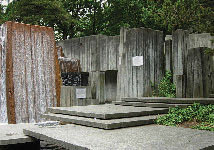 Recreational structures and landscape features also utilized the structural range and unique character of exposed concrete to advantage, as seen in Chicago’s Lincoln Park Chess Pavilion, designed by Morris Webster in 1956 (Figure 8), and the Ira C. Keller Fountain in Portland Oregon, designed by Lawrence Halprin in 1969 (Figure 9). Concrete was also popular for building interiors, with ornamental features and exposed structural elements recognized as part of the design aesthetic (See Figs. 10 and 11). Figure 10. The Berkeley City Club has significant interior spaces alld features of concrete construction, including the lobby and pool. Photos: Una Gilmartin (left) and Brian Kehoe (right), Wiss, Janney, Elstner Associates, Inc. The expanded use of concrete provided new opportunities to create dramatic spaces and ornate architectural detail on the interiors of buildings, at a significant cost savings over traditional construction practices. 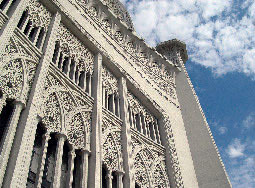 The architectural design of the Berkeley City Club in Berkeley, California, expressed Moorish and Gothic elements in concrete on the interior of the building (Figure 10). Used as a woman’s social club, the building was designed by noted California architect Julia Morgan and constructed in 1929. The vaulted ceilings, columns, and ornamental capitals of the lobby and the ornamental arches and beamed ceiling of the “plunge” are all constructed of concrete. Figure 11. 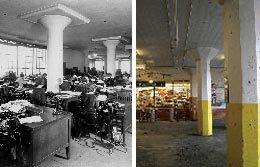 Whether in a circa 1925 office (left) or in a parking garage and retail facility (right), exposed concrete structures help characterize these building interiors. Photo: Minnesota Historical Society (left). The historic character of a building’s interior can also be conveyed in a more utilitarian manner in terms of concrete features and finishes (Figure 11). The exposed concrete structure— columns, capitals, and drop panels— is an integral part of the character of this old commercial building in Minneapolis. In concrete warehouse and factory buildings of the early twentieth century, exposed concrete columns and formboard finish concrete slab ceilings are common features as seen in this warehouse, now converted for use as a parking garage and shops. Concrete is composed of fine (sand) and coarse (crushed stone or gravel) aggregates and paste made of portland cement and water. The predominant material in terms of bulk is the aggregate. Portland cement is the binder most commonly used in modern concrete. It is commercially manufactured by blending limestone or chalk with clays that contain alumina, silica, lime, iron oxide and magnesia, and heating the compounds together to high temperatures. The hydration process that occurs between the portland cement and water results in formation of an alkali paste that surrounds and binds the aggregate together as a solid mass. Figure 8. The Chess Pavilion in Chicago’s Lincoln Park was designed by architect Morris Webster and constructed in 1956. The pavilion is a distinctive landscape feature, with its reinforced concrete cantilevered slab that provides cover for chess players. The quality of the concrete is dependent on the ratio of water to the binder; binder content; sound, durable, and well-graded aggregates; compaction during placement; and proper curing. The amount of water used in the mix affects the concrete permeability and strength. The use of excess water beyond that required in the hydration process results in more permeable concrete, which is more susceptible to weathering and deterioration. Admixtures are commonly added to concrete to adjust concrete properties such as setting or hardening time, requirements for water, workability, and other characteristics. For example, the advent of air entraining agents in the 1930s provided enhanced durability for concrete. During the twentieth century, there was a steady rise in the strength of ordinary concrete as chemical processes became better understood and quality control measures improved. In addition, the need to protect embedded reinforcement against corrosion was acknowledged. Requirements for concrete cover over reinforcing steel, increased cement content, decreased water-cement ratio, and air entrainment all contributed to greater concrete strength and improved durability. Concrete deterioration occurs primarily because of corrosion of the embedded steel, degradation of the concrete itself, use of improper techniques or materials in construction, or structural problems. The causes of concrete deterioration must be understood in order to select an appropriate repair and protection system. While reinforcing steel has played a pivotal role in expanding the applications of concrete in twentieth century architecture, corrosion of this steel has also caused deterioration in many historic structures. Reinforcing steel embedded in the concrete is normally surrounded by a passivating oxide layer that, when present, protects the steel from corrosion and aids in bonding the steel and concrete. When the concrete’s normal alkaline environment (above a pH of 10) is compromised and the steel is exposed to water, water vapor, or high relative humidity, corrosion of the steel reinforcing takes place. A reduction in alkalinity results from carbonation, a process that occurs when the carbon dioxide in the atmosphere reacts with calcium hydroxide and moisture in the concrete. Carbonation starts at the concrete’s exposed surface but may extend to the reinforcing steel over time. When carbonation reaches the metal reinforcement, the concrete no longer protects the steel from corrosion. Corrosion of embedded reinforcing steel may be initiated and accelerated if calcium chloride was added to the concrete as a set accelerator during original construction to promote more rapid curing. It may also take place if the concrete is later exposed to deicing salts, as may occur during the winter in northern climates. Seawater or other marine environments can also provide large amounts of chloride, either from inadequately washed original aggregate or from exposure of the concrete to seawater. Figure 12. 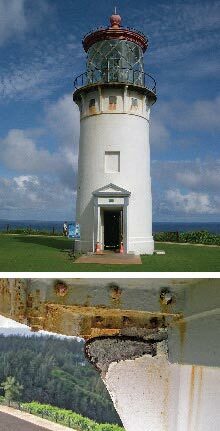 The concrete lighthouse at the Kilauea Point Light Station, Kilauea, Kauai, Hawaii, was constructed circa 1913. The concrete, which was a good quality, high strength mix for its day, is in good condition after almost one hundred years in service. Deterioration in the form of spalling related to corrosion of embedded reinforcing steel has occurred primarily in areas of higher ornamentation such as projecting bands and brackets (see close-up photo). Corrosion-related damage to reinforced concrete is the result of rust, a product of the corrosion process of steel, which expands and thus requires more space in the concrete than the steel did at the time of installation. This change in volume of the steel results in expansive forces, which cause cracking and spalling of the adjacent concrete (Figure 12). Other signs of corrosion of embedded steel include delamination of the concrete (planar separations parallel to the surface) and rust staining (often a precursor to spalling) on the concrete near the steel. Lack of proper maintenance of building elements such as roofs and drainage systems can contribute to water-related deterioration of the adjacent concrete, particularly when concrete is saturated with water and then exposed to freezing temperatures. As water within the concrete freezes, it expands and exerts forces on the adjacent concrete. Repeated freezing and thawing can result in the concrete cracking and delaminating. Such damage appears as surface degradation, including severe scaling and micro-cracking that extends into the concrete. The condition is most often observed near the surface of the concrete but can also eventually occur deep within the concrete. This type of deterioration is usually most severe at joints, architectural details, and other areas with more surface exposure to weather. In the second half of the twentieth century, concrete has utilized entrained air (the incorporation of microscopic air bubbles) to provide enhanced protection against damage due to cyclic freezing of saturated concrete. The use of certain aggregates can also result in deterioration of the concrete. Alkali-aggregate reactions—in some cases alkali-silica reaction (ASR)—occur when alkalis normally present in cement react with certain aggregates, leading to the development of an expansive crystalline gel. When this gel is exposed to moisture, it expands and causes cracking of the aggregate and concrete matrix. Deleterious aggregates are typically found only in certain areas of the country and can be detected through analysis by an experienced petrographer. Low-alkali cements as well as fly ash are used today in new construction to prevent such reactions where this problem may occur. Materials and workmanship used in the construction of historic concrete structures, particularly those built before the First World War, sometimes present potential sources of problems. For example, where the aggregate consisted of cinder from burned coal or crushed brick, the concrete tends to be weak and porous because these aggregates absorb water. Some of these aggregates can be extremely susceptible to deterioration when exposed to moisture and cyclic freezing and thawing. Concrete was sometimes compromised by inclusion of seawater or beach sand that was not thoroughly washed with fresh water, a condition more common with coastal fortifications built prior to 1900. The sodium chloride present in seawater and beach sand accelerates the rate of corrosion of the reinforced concrete. Another problem encountered with historic concrete is related to poor consolidation of the concrete during its placement in forms, or in molds in the case of precasting. This problem is especially prevalent in highly ornamental units. Early twentieth century concrete was often tamped or rodded into place, similar to techniques used in forming cast stone. Poorly consolidated concrete often contains voids (“bugholes” or “honeycombs” ), which can reduce the protective concrete cover over the embedded reinforcing bars, entrap water, and, if sufficiently large and strategically numerous, reduce localized concrete strength. Vibration technology has improved over time and flowability agents are also used today to address this problem. A common type of deterioration observed in concrete is the effect of weathering from exposure to wind, rain, snow, and salt water or spray. Weathering appears as erosion of the cement paste, a condition more prevalent in northern regions where precipitation can be highly acidic. This results in the exposure of the aggregate particles on the exposed concrete surface. Variations may occur in the aggregate exposure due to differential erosion or dissolution of exposed cement paste. Erosion can also be caused by the mechanical action of water channeled over concrete, such as by the lack of drip grooves in belt courses and sills, and by inadequate drainage. In addition, high-pressure water when used for cleaning can also erode the concrete surface. In concrete structures built prior to the First World War, concrete was often placed into forms in relatively short vertical lifts due to limitations in lifting and pouring techniques available at the time. Joints between different concrete placements (often termed cold joints or lift lines) may sometimes be considered an important part of the character of a concrete element (Figure 13). However, wide joints may permit water to infiltrate the concrete, resulting in more rapid paste erosion or freeze-thaw deterioration of adjacent concrete in cold climates. Figure 13. Fort Casey on Admiralty Head, Fort Casey, Washington, was constructed in 1898. The lift lines from placement of concrete are clearly visible on the exterior walls and characterize the finished appearance. In the early twentieth century, concrete was sometimes placed in several layers parallel to the exterior surface. A base concrete was first created with formwork and then a more cement rich mortar layer was applied to the exposed vertical face of the base concrete. The higher cement content in the facing concrete provided a more water-resistant outer layer and finished surface. The application of a cement-rich top layer, referred to in some early concrete publications as “waterproofing,” was also used on top surfaces of concrete walls, or as the top layer in sidewalks. With this type of concrete construction, deterioration can occur over time as a result of debonding between layers, and can proceed very rapidly once the protective cement-rich layer begins to break down. It is common for historic concrete to have a highly variable appearance, including color and finish texture. Different levels of aggregate exposure due to paste erosion are often found in exposed aggregate concrete. This variability in the appearance of historic concrete increases the level of difficulty in assessing and repairing weathered concrete. Characteristic signs of failure in concrete include cracking, spalling, staining, and deflection. Cracking occurs in most concrete but will vary in depth, width, direction, pattern, and location, and can be either active or dormant (inactive). Active cracks can widen, deepen, or migrate through the concrete, while dormant cracks remain relatively unchanged in size. Some dormant cracks, such as those caused by early age shrinkage of the concrete during curing, are not a structural concern but when left unrepaired, can provide convenient channels for moisture penetration and subsequent damage. Random surface cracks, also called map cracks due to their resemblance to lines on a map, are usually related to early-age shrinkage but may also indicate other types of deterioration such as alkali-silica reaction. Structural cracks can be caused by temporary or continued overloads, uneven foundation settling, seismic forces, or original design inadequacies. Structural cracks are active if excessive loads are applied to a structure, if the overload is continuing, or if settlement is ongoing. These cracks are dormant if the temporary overloads have been removed or if differential settlement has stabilized. Thermally-induced cracks result from stresses produced by the expansion and contraction of the concrete during temperature changes. These cracks frequently occur at the ends or re-entrant corners of older concrete structures that were built without expansion joints to relieve such stress. Figures 14. Layers of architectural concrete that have debonded (spalled) from the surface were removed from a historic water tank during the investigation performed to assess existing conditions. Photos: Anita Washko, Wiss, Janney, Elstner Associates, Inc.
Spalling (the loss of surface material) is often associated with freezing and thawing as well as cracking and delamination of the concrete cover over embedded reinforcing steel. Spalling occurs when reinforcing bars corrode and the corrosion by-products expand, creating high stresses on the adjacent concrete, which cracks and is displaced. Spalling can also occur when water absorbed by the concrete freezes and thaws (Figure 14). In addition, surface spalling or scaling may result from the improper finishing, forming, or other surface phenomena when water-rich cement paste (laitance) rises to the surface. The resulting weak material is vulnerable to spalling of thin layers, or scaling. In some cases, spalling of the concrete can diminish the load-carrying capacity of the structure. Deflection is the bending or sagging of structural beams, joists, or slabs, and can be an indication of deficiencies in the strength and structural soundness of concrete. This condition can be produced by overloading, corrosion of embedded reinforcing, or inadequate design or construction, such as use of low-strength concrete or undersized reinforcing bars. Staining of the concrete surface can be related to soiling from atmospheric pollutants or other contaminants, dirt accumulation, and the presence of organic growth. However, stains can also indicate more serious underlying problems, such as corrosion of embedded reinforcing steel, improper previous surface treatments, alkali-aggregate reaction, or efflorescence, the deposition of soluble salts on the surface of the concrete as a result of water migration (Figure 15). The significance of a historic concrete building or structure—including whether it is important for its architectural or engineering design, for its materials and construction techniques, or both—guides decision making about repair and, if needed, replacement methods. Determining the causes of deterioration is also central to the development of a conservation and repair plan. With historic concrete buildings, one of the more difficult challenges is allowing for sufficient time during the planning phase to analyze the concrete, develop mixes, and provide time for adequate aging of mock-ups for matching to the original concrete. An understanding of the original construction techniques (cement characteristics, mix design, original intent of assembly, type of placement, precast versus cast in place, etc.) and previous repair work performed on the concrete is important in determining causes of existing deterioration and the susceptibility of the structure to potential other types of deterioration. For example, concrete placed in short lifts (individual concrete placements) or constructed in precast segments will have numerous joints that can provide entry points for water infiltration. Inappropriate prior repairs, such as installation of patches using an incompatible material, can affect the future performance of the concrete. Such prior repairs may require corrective work. As with other preservation projects, three primary approaches are usually considered for historic concrete structures: maintenance, repair, or replacement. Maintenance and repair best achieve the preservation goal of minimal intervention and the greatest retention of existing historic fabric. However, where elements of the building are severely deteriorated or where inherent problems with the material lead to ongoing failures, replacement may be necessary. During planning, information is gathered through research, visual survey, inspection openings, and laboratory studies. The material should then be reviewed by professionals experienced in concrete deterioration to help evaluate the nature and causes of the concrete problems, to assess both the short-term and long-term effects of the deterioration, and to formulate proper repair approaches. Figure 15. Evidence of moisture movement through concrete is apparent in the form of mineral deposits on the concrete surface. Cyclic freezing and thawing of entrapped moisture, and corrosion of embedded reinforcement, have also contributed to deterioration of the concrete column on this fence at Crocker Field in Fitchburg, Massachusetts, designed by the Olmsted Brothers. A condition assessment of a concrete building or structure should begin with a review of all available documents related to original construction and prior repairs. While plans and specifications for older concrete buildings are not always available, they can be an invaluable resource and every attempt should be made to find them. They may provide information on the composition of the concrete mix or on the type and location of reinforcing bars. If available, documents related to past repairs should also be reviewed to understand how the repairs were made and to help evaluate their anticipated performance and service life. Archival photographs can also provide a valuable source of information about original construction. A visual condition survey will help identify and evaluate the extent, types, and patterns of distress and deterioration. The American Concrete Institute offers several useful guides on how to perform a visual condition survey of concrete. Generally, the condition assessment begins with an overall visual survey, followed by a close-up investigation of representative areas to obtain more detailed information about modes of deterioration. A number of nondestructive testing methods can be used in the field to evaluate concealed conditions. Basic techniques include sounding with a hand-held hammer (or for horizontal surfaces, a chain) to help identify areas of delamination. 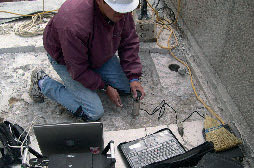 More sophisticated techniques include impact-echo testing (Figure 16), ground penetrating radar, pulse velocity, and other methods that characterize concrete thickness and locate voids or delaminations. Magnetic detection instruments are used to locate embedded reinforcing steel and can be calibrated to identify the size and depth of reinforcement. Corrosion measurements can be taken using copper-copper sulfate half-cell tests or linear polarization techniques to determine the probability or rate of active corrosion of the reinforcing steel. To further evaluate the condition of the concrete, samples may be removed for laboratory study to determine material components and composition, and causes of deterioration. Samples need to be representative of existing conditions but should be taken from unobtrusive locations. Laboratory studies of the concrete may include petrographic evaluation following ASTM C856, Practice for Petrographic Examination of Hardened Concrete. Petrographic examination, consisting of microscopical studies performed by a geologist specializing in the evaluation of construction materials, is performed to determine air content, water-cement ratio, cement content, and general aggregate characteristics. Laboratory studies can also include chemical analyses to determine chloride content, sulfate content, and alkali levels of the concrete; identification of deleterious aggregates; and determination of depth of carbonation. Compressive strength studies can be conducted to evaluate the strength of the existing concrete and provide information for repair work. The laboratory studies provide a general identification of the original concrete’s components and aggregates, and evidence of damage due to various mechanisms including cyclic freezing and thawing, alkali-aggregate reactivity, or sulfate attack. Information gathered through laboratory studies can also be used to help develop a mix design for the repair concrete. As with other historic structures, concrete structures are cleaned for several reasons: to improve the appearance of the concrete, as a cyclical maintenance measure, or in preparation for repairs. Consideration should first be given to whether the historic concrete structure needs to be cleaned at all. If cleaning is required, then the gentlest system that will be effective should be selected. Three primary methods are used for cleaning concrete: water methods, abrasive surface treatments, and chemical surface treatments. Low-pressure water (less than 200 psi) or steam cleaning can effectively remove surface soiling from sound concrete; however, care is required on fragile or deteriorated surfaces. In addition, water and steam methods are typically not effective in removing staining or severe soiling. Power washing with high-pressure water is sometimes used to clean or remove coatings from sound, high-strength concrete, but high-pressure water washing is generally damaging to and not appropriate for concrete on historic structures. Figure 16. Impact echo testing is performed on a concrete structural slab to help determine depth of deterioration. In this method, a short pulse of energy is introduced into the structure and a transducer mounted on the impacted surface of the structure receives the reflected input waves or echoes. These waves are analyzed to help identify flaws and deterioration within the concrete. When used with proper controls and at very low pressures (typically 35 to 75 psi), microabrasive surface treatments using very fine particulates, such as dolomitic limestone powder, can sometimes clean effectively. However, microabrasive cleaning may alter the texture and surface reflectivity of concrete. Some concrete can be damaged even by fine particulates applied at very low pressures. Chemical surface treatments can clean effectively but may also alter the appearance of the concrete by bleaching the concrete, removing the paste, etching the aggregate, or otherwise altering the surface. Detergent cleaners or mild, diluted acid cleaners may be appropriate for removal of staining or severe soiling. Cleaning products that contain strong acids such as hydrochloric (muriatic) or hydrofluoric acid, which will damage concrete and are harmful to persons, animals, site features, and the environment, should not be used. For any cleaning process, trial samples should be performed prior to full-scale implementation. The intent of the cleaning program should not be to return the structure to a like new appearance. Concrete can age gracefully, and as long as soiling is not severe or deleterious, many structures can still be appreciated without extensive cleaning. The maintenance of historic concrete often is thought of in terms of appropriate cleaning to remove unattractive dirt or soiling materials. However, the implementation of an overall maintenance plan for a historic structure is the most effective way to help protect historic concrete. For examples, the lack of maintenance to roofs and drainage systems can promote water related damage to adjacent concrete features. The repeated use of deicing salts in winter climates can pit the surface of old concrete and also may promote decay in embedded steel reinforcements. Inadequate protection of concrete walls adjacent to driveways and parking areas can result in the need for repair work later on. The maintenance of historic concrete involves the regular inspection of concrete to establish baseline conditions and identify needed repairs. Inspection tasks involve monitoring protection systems, including sealant joints, expansion joints, and protective coatings; reviewing existing conditions for development of distress such as cracking and delaminations; documenting conditions observed; and developing and implementing a cyclical repair program. Figure 17. (a) The 63rd Street Beach House was constructed on the shoreline of Chicago in 1919. The highly exposed aggregate concrete of the exterior walls of the beach house was used for many buildings in the Chicago parks as an alternative to more expensive stone construction. Photo: Leslie Schwartz Photography. (b) Concrete deterioration included cracking, spalling, and delamination caused by corrosion of embedded reinforcing steel and concrete damage due to cyclic freezing and thawing. (c) Various sizes and types of aggregates were reviewed for matching to the original concrete materials. (d) Mock-ups of the concrete repair mix were prepared for comparison to the original concrete. Considerations included aggregate type and size, cement color, proportions, aggregate exposure, and surface finish. (e) The craftsman finished the surface to replicate the original appearance in a mock-up on the structure. Here, he used a nylon bristle brush to remove loose paste and expose the aggregate, creating a variable surface to match the adjacent original concrete. Sealants are an important part of maintenance of historic concrete structures. Elastomeric sealants, which have replaced traditional oil-resin based caulks for many applications, are used to seal cracks and joints to keep out moisture and reduce air infiltration. Sealants are commonly used at windows and door perimeters, at interfaces between concrete and other materials, and at attachments to or through walls or roofs, such as with lamps, signs, or exterior plumbing fixtures. Where used for crack repairs on historic facades, the finished appearance of the sealant application must be considered, as it may be visually intrusive. In some cases, sand can be broadcast onto the surface of the sealant to help conceal the repair. Urethane and polyurethane sealants are often used to seal joints and cracks in concrete structures, paving, and walkways; these sealants provide a service life of up to ten years. High-performance silicone sealants also are often used with concrete, as they provide a range of movement capabilities and a service life of twenty years or more. Some silicone sealants may stain adjacent materials, which may be a problem with more porous concrete, and may also tend to accumulate dust and dirt. The effectiveness of sealants for sealing joints and cracks depends on numerous factors including proper surface preparation and application. Sealants should be examined as part of routine maintenance inspections, as these materials deteriorate faster than their substrates and must be replaced periodically as a part of cyclical maintenance. 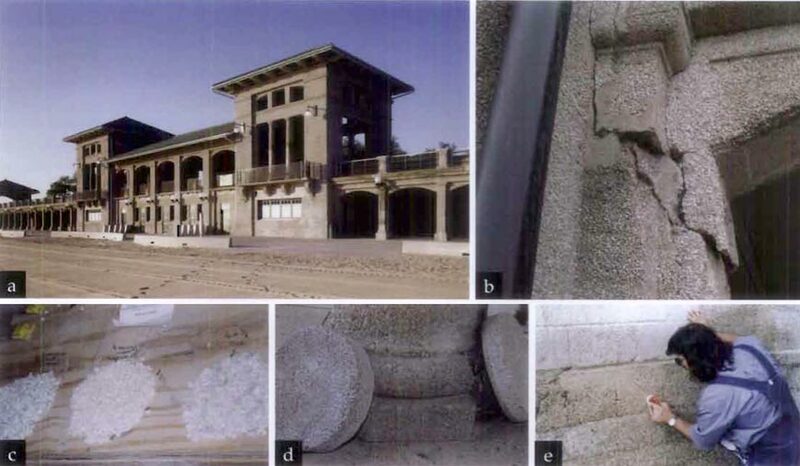 Repair of historic concrete may be required to address deterioration because the original design and construction did not provide for long-term durability, or to facilitate a change in use of the structure. Examples include increasing concrete cover to protect reinforcing steel and reducing water infiltration into the structure by repair of joints. Any such improvements must be thoroughly evaluated for compatibility with the original design and appearance. Care is required in all aspects of historic concrete repair, including surface preparation; installation of formwork; development of the concrete mix design; and concrete placement, consolidation, and curing. An appropriate repair program addresses existing distress and reduces the rate of future deterioration, which in many cases involves moisture-related issues. The repair program should incorporate materials and methods that are sympathetic to the existing materials in character and appearance, and which provide good long-term performance. In addition, repair materials should age and weather similarly to the original materials. In order to best achieve these goals, concrete repair projects should be divided into three phases: development of trial repair procedures, trial repairs and evaluation, and production repair work. For any concrete repair project, the process of investigation, laboratory analysis, trial samples, mock-ups, and full-scale repairs allows ongoing refinement of the repair work as well as implementation of quality-control measures. The trial repair process provides an opportunity for theowner, architect, engineer, and contractor to evaluate the concrete mix design and the installation and finishing techniques for the repairs from both technical and aesthetic standpoints. The final repair materials and procedures should match the original concrete in appearance while meeting the established criteria for durability, Information gathered through trial repairs and mock-ups is invaluable in refining the construction documents prior to the start of the overall repair project (Figure 17). In undertaking surface preparation for historic concrete repair, care must be taken to limit removal of existing material while still providing an appropriate substrate for repairs. This is particularly important where ornamentation and fine details are involved. Preparation for localized repairs usually begins with removal of the loose concrete to determine the general extent of the repair, followed by saw-cutting the perimeter of the repair area. The repair area should extend beyond the area of concrete deterioration to a sufficient extent to provide a sound substrate. When repairing concrete with an exposed aggregate or other special surface texture, a sawcut edge may be too visually evident. To hide the repair edge, techniques such as lightly hand-chipping the edge of the patch may be used to conceal the joint between the original concrete and the new repair material. The depth to which the concrete needs to be removed may be difficult to determine without invasive probing in the repair area. Removal of concrete should typically extend beyond the level of the reinforcing steel, if present, so that the patch encapsulates the reinforcing steel, which provides mechanical attachment for the repair. If the concrete was originally of lower strength and quality, the assessment of present soundness is more difficult. Deteriorated and unsound concrete is typically removed using pneumatic chipping hammers. Removal of concrete in historic structures is better controlled by using smaller chipping hammers or hand tools. The area of the concrete to be repaired and the exposed reinforcing steel are then cleaned, usually by careful sandblast and air blast procedures applied only within the repair area. Adjacent original concrete surfaces should be protected during this work. In some cases, project constraints such as dust control may limit the ability to thoroughly clean the concrete and steel. For example, it may be necessary to use needle scaling (a small pneumatic impact device) and wire brushing instead of sandblasting. Supplemental steel may be needed when existing reinforcing steel is severely deteriorated, or if reinforcing steel is not present in repair areas. Exposed existing reinforcing and other embedded steel elements should be cleaned, primed, and painted with a corrosion-inhibiting coating. The patching material should be reinforced and mechanically attached to the existing concrete. Reinforcement materials used in repairs most often include mild steel, epoxy-coated steel, or stainless steel, depending on existing conditions. Special formwork is needed to recreate ornamental concrete features—which may be complex, in high relief, or architecturally detailed—and to provide special surface finishes such as wood form board textures. Construction of the formwork itself requires particular skill and craftsmanship. Reusable forms can be used for concrete ornamentation that is repeated across a building facade, or precast concrete elements may be used to replace missing or unrepairable architectural features. Formwork for ornamental concrete is often created using a four-step process: a casting of the original concrete is taken; a plaster replica of the unit is prepared; a mold or form is made from the plaster replica; and a new concrete unit is cast. Custom formwork and molds are often the work of specialty companies, such as precasters and cast stone fabricators. The process of forming architectural features or special surface textures is particularly challenging if early age stripping (removal of formwork early in the concrete curing process) is needed to perform surface treatment on the concrete. Timing for formwork removal is related to strength gain, which in turn is partly dependent on temperature and weather conditions. Early age removal of formwork in highly detailed concrete can lead to damage of the new concrete that has not yet gained sufficient strength through curing. Selection and design of proper repair materials is a critical component of the repair project. This process requires evaluation of the performance, characteristics, and limitations of the repair materials, and may involve laboratory testing of proposed materials and trial repairs. The materials should be selected to address the specific type of repair required and to be compatible with special characteristics of the original concrete. Some modern repair materials are designed to have a high compressive strength and to be impermeable. Even though inherently durable, these newer materials may not be appropriate for use in repairing a low strength historic concrete. Figure 18. (a) Exposed aggregate precast concrete is sounded with a hammer to detect areas of deterioration. Corrosion of the exposed reinforcing steel bar has led to spalling of the adjacent concrete. (b) Samples of aggregate considered for use in repair concrete are compared to the original concrete materials in terms of size, color, texture, and reflectance. 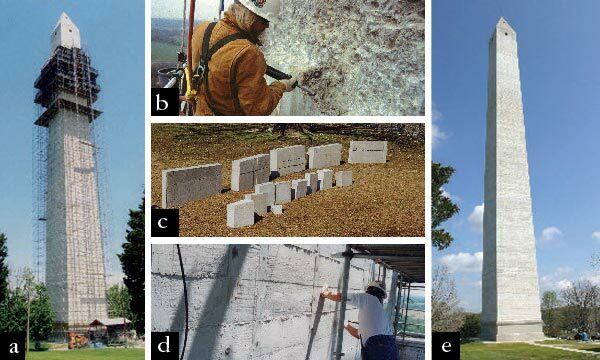 (c) Various sample panels are made using the selected concrete repair mix design for comparison to the original concrete on the building, and the mix design is adjusted based on review of the samples. (d) After removal of the spall, the concrete surface is prepared for installation of a formed patch. (e) Prior to placement of the concrete, a retarding agent is brush-applied to the inside face of the formwork to slow curing at the surface. After the concrete is partially cured, the forms are removed and the surface of the concrete is rubbed to remove some of the paste and expose the aggregate to match the original concrete. The concrete’s durability, or resistance to deterioration, and the materials and methods selected for repair depend on its composition, design, and quality of workmanship. In most cases, a mix design for durable replacement concrete should use materials similar to those of the original concrete mix. Prepackaged materials are often not appropriate for repair of historic concrete. The concrete patching material can be air entrained or polymer-modified if subject to exterior exposure, and should incorporate an appropriate selection of aggregate and cement type, and proper water content and water to cement ratio. Some admixtures, including polymer modifiers, may change the appearance of the concrete mix. Design of the concrete patching material should address characteristics required for durability, workability, strength gain, compressive strength, and other performance attributes. During installation of the repair, skilled workmanship is required to ensure proper mixing procedures, placement, consolidation, and curing. Repair measures should be selected that retain as much of the original material as possible, while providing for removal of an adequate amount of deteriorated concrete to provide a sound substrate for a durable repair. The installed repair must visually match the existing concrete as closely as possible and should be similar in other aspects such as compressive strength, permeability, and other characteristics important in the mix design of the concrete (Figure 18). Understanding the original construction techniques often provides opportunities in the design of repairs. For example, joints between the new and old concrete can be hidden in changes in surface profile and cold joints. The required patching mix for the concrete to be used in the repair will likely need to be specially designed to replicate the appearance of the adjacent historic concrete. A high level of craftsmanship is required for finishing of historic concrete, in particular to create the sometimes inconsistent finish and variation in the original concrete in contrast to the more even appearance required for most non-historic repairs. To match the various characteristics of the original concrete, trial mixes should be developed. These mixes need to take into account the types and colors of aggregates and paste present in the original concrete. Different mixes may be needed because of variations in the appearance and composition of the historic concrete. The trials should utilize different forming and finishing techniques to achieve the best possible match to the original concrete. Initial trials should first take place on site but off the structure. The mix designs providing the best match are then installed as trial repairs on the structure, and assessed after they have cured. Achieving compatibility between repair work and original concrete may be difficult, especially given the variability often present in historic concrete materials and finishes. Formed rather than trowel-applied patch repairs are recommended for durability, as forming permits better ranges of mix ingredients (such as coarse aggregates) and improved consolidation as compared to trowel-applied repairs. Parge coatings usually are not recommended as they do not provide as durable repair as formed concrete. However, in some cases parge coatings may be appropriate to match an original parged surface treatment. Proper placement and finishing of the repair are important to obtain a match with the original concrete. To minimize problems associated with rapid curing of concrete, such as surface cracking, it is important to use proper curing methods and to allow for sufficient time. Hairline cracks that show no sign of increasing in size may often be left unrepaired. The width of the crack and the amount of movement usually limits the selection of crack repair techniques that are available. Although it is difficult to determine whether cracks are moving or non-moving, and therefore most cracks should be assumed to be moving, it is possible to repair non-moving cracks by installation of a cementitious repair mortar matching the adjacent concrete. It is generally desirable not to widen cracks prior to the mortar application. Repair mortar containing sand in the mix may be used for wider cracks; unsanded repair mortar may be used for narrower cracks. 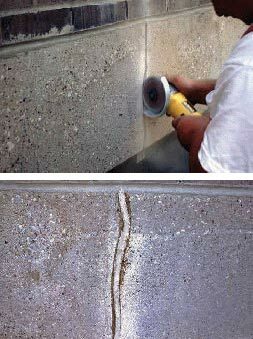 When it is desirable to re-establish the structural integrity of a concrete structure involving dormant cracks, epoxy injection repair has proven to be an effective procedure. Such a repair is made by first sealing the crack on both sides of a wall or structural member with epoxy, polyester, wax, tape, or cement slurry, and then injecting epoxy through small holes or ports drilled in the concrete. Once the epoxy in the crack has hardened, the surface sealing material may be removed; however, this type of repair is usually quite apparent. Although it may be possible to inject epoxy without leaving noticeable residue, this process is difficult and, in general, the use of epoxy repairs in visible areas of concrete on historic structures is not recommended. Active structural cracks (which move as loads are added or removed) and thermal cracks (which move as temperatures fluctuate) must be repaired in a manner that will accommodate the anticipated movement. In some more extreme cases, expansion joints may have to be introduced before crack repairs are undertaken. Active cracks may be filled with sealants that will adhere to the sides of the cracks and will compress or expand during crack movement. The design, detailing, and execution of sealant repairs require considerable attention, or they will detract from the appearance of the historic building. The routing and cleaning of a crack, and installation of an elastomeric sealant to prevent water penetration, is used to address cracks where movement is anticipated. 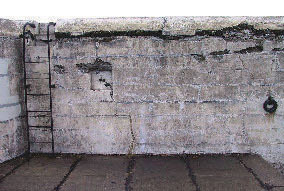 However, unless located in a concealed area of the concrete, this technique is often not acceptable for historic structures because the repair will be visually intrusive (Figure 19). Other approaches, such as installation of a cementitious crack repair, may need to be considered even though this type of repair may be less effective or have a shorter service life than a sealant repair. If specific components of historic concrete structures are beyond repair, replacement components can be cast to match historic ones. Replacement of original concrete should be carefully considered and viewed as a method of last resort. In some cases, such as for repeated ornamental units, it may be more cost-effective to fabricate precast concrete units to replace missing elements. The forms created for precast or cast-in-place units can then be used again during future repair projects. Figure 19. A high-speed grinder is used to widen a crack in preparation for installation of a sealant. This process is called "routing." After the crack is prepared, the sealant is installed to prevent moisture infiltration through the crack. Although sealant repairs can provide a durable, watertight repair for moving cracks, they tend to be very visible. Careful mix formulation, placement, and finishing are required to ensure that replacement concrete units will match the historic concrete. There is often a tendency to make replacement concrete more consistent in appearance than the original concrete. The consistency can be in stark contrast with the variability of the original concrete due to original construction techniques, architectural design, or differential exposure to weather. Trial repairs and mock-ups are used to evaluate the proposed replacement concrete work and to refine construction techniques (Fig 20). Coatings and Penetrating Sealers. Protection systems such as a penetrating sealers or film forming coating are often used with non-historic structures to protect the concrete and increase the length of the service life of concrete repairs. However, film-forming coatings are often inappropriate for use on a historic structure, unless the structure was coated historically. Film-forming coatings will often change the color and appearance of a surface, and higher build coatings can also mask architectural finishes and ornamental details. For example, the application of a coating on concrete having a formboard finish may hide the wood texture of the surface. Pigmented film-forming coatings are also typically not appropriate for use over exposed aggregate concrete, where the uncoated exposed surface contributes significantly to the historic character of the facade. In cases where the color of a substrate needs to be changed, such as to modify the appearance of existing repairs, an alternative to pigmented film-forming coatings is the use of pigmented stains. Many proprietary clear, penetrating sealers are currently available to protect concrete substrates. These products render fine cracks and pores within the concrete hydrophobic; however, they do not bridge or fill cracks. Clear sealers may change the appearance of the concrete in that treated areas become more visible after rain in contrast to the more absorptive areas of original concrete. Once applied, penetrating sealers cannot be effectively removed and are therefore considered irreversible. They should not be used on historic concrete without thorough prior consideration. However, clear penetrating sealers provide an important means of protection for historic concrete that is not of good quality and can help to avoid more extensive future repairs or replacement. Thus they are sometimes appropriate for use on historic concrete. Once applied, these sealers will require periodic re-application. Figure 20. (a) The Jefferson Davis Memorial in Fairview, Kentucky, constructed from 1917-1924, is 351 feet tall and constructed of unreinforced concrete. The walls of the memorial are 8 feet thick at the base and 2 feet thick at the top of the wall. Access to the monument for investigation was provided by rappelling techniques, while ground supported and suspended scaffolding was used to access the exterior during repairs. (b) The concrete was severely deteriorated at isolated locations, with spalling and damage from cyclic freezing and thawing of entrapped water. In addition, previous repairs were at the end of their service life and removal of deteriorated concrete and failed previous repairs was required. Light duty chipping hammers were used to avoid damage to adjacent material when removing deteriorated concrete to the level of sound concrete. (c) Field samples were performed to match the color, finish, and texture of the original concrete. A challenge in matching of historic concrete is achieving variability of appearance. (d) The completed surface after repairs exhibits intentional variability of the concrete surface to match the appearance of the original concrete. Some formwork imperfections that would normally be removed by finishing were intentionally left in place, to replicate the highly variable finish of the original concrete. (e) The Jefferson Davis Memorial after completion of repairs in 2004. Photo e: Joseph Lenzi, Senler, Campbell & Associates, Inc.
Waterproofing membranes are systems used to protect concrete surfaces such as roofs, terraces, plazas, or balconies, as well as surfaces below grade. Systems range from coal tar pitch membranes used on older buildings, to asphalt or urethane-based systems. On historic buildings, membrane systems are typically used only on surfaces that were originally protected by a similar system and surfaces that are not visible from grade. Waterproofing membranes may be covered by roofing, paving, or other architectural finishes. Laboratory and field testing is recommended prior to application of a protection system or treatment on any concrete structure; testing is even more critical for historic structures because many such treatments are not reversible. As with other repairs, trial samples are important to evaluate the effectiveness of the treatment and to determine whether it will harm the concrete or affect its appearance. Cathodic Protection. Corrosion is an electrochemical process in which electrons flow between cathodic (positively charged) and anodic (negatively charged) areas on a metal surface; corrosion occurs at the anodes. Cathodic protection is a technique used to control the corrosion of metal by making the whole metal surface the cathode of an electrochemical cell. This technique is used to protect metal structures from corrosion and is also sometimes used to protect steel reinforcement embedded in concrete. For reinforced concrete, cathodic protection is typically accomplished by connecting an auxiliary anode to the reinforcing so that the entire reinforcing bar becomes a cathode. In sacrificial anode (passive) systems, current flows naturally by galvanic action between the less noble anode (such as zinc) and the cathode. In impressed-current (active) systems, current is impressed between an inert anode (such as titanium) and the cathode. Cathodic protection is intended to reduce the rate of corrosion of embedded steel in concrete, which in turn reduces overall deterioration. Protecting embedded steel from corrosion helps to prevent concrete cracking and spalling. Impressed-current cathodic protection is the most effective means of mitigating steel corrosion and has been used in practical structural applications since the 1970s. However, impressed-current cathodic protection systems are typically the most costly to install and require substantial ongoing monitoring, adjustment, and maintenance to ensure a proper voltage output (protection current) over time. Sacrificial anode cathodic protection dates back to the 1800s, when the hulls of ships were protected using this technology. Today many industries utilize the concept of sacrificial anode cathodic protection for the protection of steel exposed to corrosive environments. It is less costly than an impressed-current system, but is somewhat less effective and requires reapplication of the anode when it becomes depleted. Re-alkalization. Another technique currently available to protect concrete is realkalization, which is a process to restore the alkalinity of carbonated concrete. The treatment involves soaking the concrete with an alkaline solution, in some cases forcing it into the concrete to the level of the reinforcing steel by passage of direct current. These actions increase the alkalinity of the concrete around the reinforcement, thus restoring the protective alkaline environment for the reinforcement. Re-alkalization has been used in the United States for a little more than a decade. Like impressed-current cathodic protection methods, it is costly. However, it is a one-time operation and therefore does not require periodic reapplication. Careful evaluation of existing conditions, the causes and nature of distress, and environmental factors is essential before a protection method is selected and implemented. Not every protection system will be effective on each structure. In addition, the level of intrusion caused by the protection system must be carefully evaluated before it is used on a historic concrete structure. In the United States, concrete has been a popular construction material since the late nineteenth century and recently has gained greater recognition as a historic material. Preservation of historic concrete requires a thorough understanding of the causes and types of deterioration, as well as of repair and replacement materials and methods. It is important that adequate time is allotted during the planning phase of a project to provide for trial repairs and mock-ups in order to evaluate the effectiveness and aesthetics of the repairs. Careful design is essential and, as with other preservation efforts, the skill of those performing the work is critical to the success of the repairs. The successful repair of many historic concrete structures in recent years demonstrates that the techniques and materials now available can extend the life of such structures and help ensure their preservation. Paul Gaudette is an engineer with Wiss, Janney, Elstner Associates, Inc., in Chicago, Illinois. Deborah Slaton is an architectural conservator with Wiss, Janney, Elstner Associates, Inc., in Northbrook, Illinois. All photographs by Paul Gaudette unless otherwise stated. The authors wish to thank William Bing Coney, author of the first edition of this preservation brief, who served as a peer reviewer for the current edition. In addition, the authors gratefully acknowledge the assistance of the following individuals as peer reviewers of this brief: Arne Johnson and Una Gilmartin, Wiss, Janney, Elstner Associates, Inc.; Robert Joyce, Quality Restorations, Inc.; Susan Macdonald, New South Wales Heritage Office; Miles T. Murray, Restruction Corporation; and Jack Pyburn, OJP/Architect, Inc. Anne E. Grimmer, Chad Randl, and former staff Sharon C. Park, FAIA, of the Technical Preservation Services, National Park Service, offered valuable comments during development of the brief. Charles E. Fisher of the National Park Service was the technical editor for this publication project. This publication has been prepared pursuant to the National Historic Preservation Act of 1966, as amended, which directs the Secretary of the Interior to develop and make available information concerning historic properties. Comments about this publication should be addressed to: Charles E. Fisher, Technical Preservation Publications Program Manager, Technical Preservation Services—2255, National Park Service, 1849 C Street, NW, Washington, DC 20240. This publication is not copyrighted and can be reproduced without penalty. Normal procedures for credit to the authors and the National Park Service should be provided. The photographs used in this publication may not be used to illustrate other publications without permission of the owners. American Concrete Institute. Guide for Making a Condition Survey of Concrete in Service. ACI Committee 201, ACI 201.1R-92. American Concrete Institute. Guide to Evaluation of Concrete Structures before Rehabilitation. ACI Committee 364, ACI 364.1R-07. American Concrete Institute. Concrete Repair Guide. ACI Committee 546, ACI 546R-04. American Concrete Institute. Guide for Evaluation of Existing Concrete Buildings. ACI Committee 437, ACI 437R-03. Childe, H.L. Manufacture and Uses of Concrete Products and Cast Stone. London: Concrete Publications Limited, 1930. Collins, Peter. Concrete: The Vision of a New Architecture. New York, New York: Faber and Faber, 1959. Cowden, Adrienne B., comp. Historic Concrete: An Annotated Bibliography. Washington, D.C.: National Park Service, 1993. Komandant, August E. Contemporary Concrete Structures. New York, New York: McGraw Hill, 1972. Erlemann, Gustav G. “Steel Reinforcing Bar Specification in Old Structures.” Concrete International, April 1999, 49–50. Federal Highway Administration. Guide to Nondestructive Testing of Concrete. FHWA Publication Number FHWA-SA-97-105. Gaudette, Paul E. “Special Considerations in Repair of Historic Concrete.” Concrete Repair Bulletin, January/February 2000, 12–13. Jester, Thomas C., ed. Twentieth Century Building Materials. New York, New York: McGraw-Hill, 1995. Johnson, Arne P., and Seung Kyoung Lee. “Protection Methods for Historic Concrete at Soldier Field.” Preserve and Play: Preserving Historic Recreation and Entertainment Sites. Washington, D.C.: Historic Preservation Education Foundation, National Council for Preservation Education, and National Park Service, 2006. Macdonald, Susan, ed. Concrete: Building Pathology. Osney Mead, Oxford, U.K.: Blackwell Science, 2003. McGovern, Martin S. “A Clear View of Sealers.” Concrete Construction, January 2000, 53–58. Morton, W. Brown III, Gary L. Hume, Kay D. Weeks, H. Ward Jandl, and Anne E. Grimmer. The Secretary of the Interior’s Standards for Rehabilitation & Illustrated Guidelines for Rehabilitating Historic Buildings. Washington, D.C.: National Park Service, 1983, reprinted 1997. “Repairing Cracks.” Concrete Repair Digest, August/September 1992, 160–164. Condensed from ACI document 224.1R-93. Slaton, Deborah. 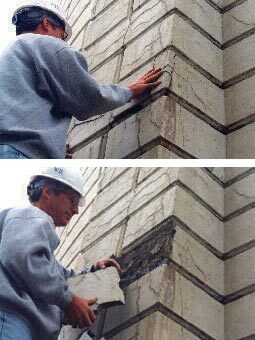 “Cleaning Historic Concrete.” Concrete Repair Bulletin, January/February 2000, 14–15.